Last week was hard. Not from hours of work on the bike or in the pool, quite the opposite. 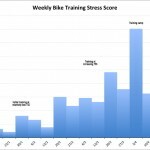 After a few months of very consistent, very positive training I was a wreck! My body shut down; I felt vaguely ill exhibiting a range of symptoms: lethargy, water retention, weight fluctuation and fatigue. All the good work in Lanzarote was draining away. I watched as fitness dropped. Only last week I wrote about the pitfalls of chasing numbers, but everyone likes to chase. As one of my athletes reminded me, if you’re ill you need to recover. I followed my own advice, backed down and worked on other projects. I tried to train – a couple of rides and that ten kilometre swim. The signs weren’t good. Perceived exertion was high whilst intensity was relatively low; sessions I’d cruised through the week before were a struggle. The relationship between fitness, fatigue and performance has been a recurring theme through May. Blog posts are rarely created in a vacuum and my focus was driven by email exchanges and observations in training. Whilst offering advice on managing training load I’d stumbled into my own trap. At least it would provide an example to close the subject with. 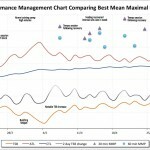 This year’s Performance Management Chart is comparatively reserved; a gradual build up of fitness over a period of months instead of the usual roller coaster between events. The growth in fitness may have been slower, but as I’ve previously observed it still resulted in a protracted period of negative TSB (form). Recovery was inevitably required, but I thought it was dealt with in early May. 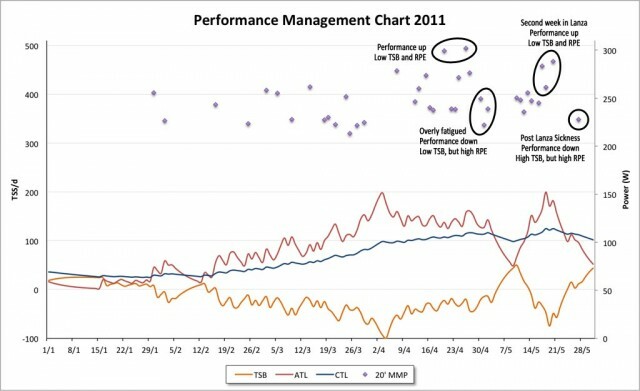 You can see the decline in performance at the end of April. One week I produce some of my best twenty minute peak powers, the next I struggle to hit them. In both cases my fitness (CTL) and form are comparable, but notably the perceived exertion has changed. The effort seems harder whilst the results weaker. I’ve rarely sustained fitness growth for this length of time, when I have there is a limit. This was it. The week’s break from intensive training was enough to take me to Lanzarote feeling fresh. As is inevitable on a camp I rapidly increase fitness and with it fatigue. Week one produced no notable performances; efforts were solid and well calibrated to their RPE, but I wasn’t at my best. The second week saw me lifting the game and in general performance was improved. After a recovery period the first few sessions are rarely my best, it takes time to produce good results again. I had the fitness built over previous months, I just needed to reacquaint the body with training. The first week provided that introduction and a single recovery day was sufficient for me to push harder in week two. Again performance was higher, but the perceived exertion matched the effort. On my return I’d every intent of continuing the work on the bike. I’d taken a break around the Ironman and felt sure I must be recovered. As the solitary, highlighted power value shows – my best effort last week barely registers. More importantly that felt like hard work. Not in the same way as my hardest sessions, but I couldn’t manage more. Rest really was required. Real closure on this topic comes in two weeks time – with a week of training I should see improved performance again. I’m feeling recovered and ready to start a block that will carry me through to the Outlaw Triathlon. A steady and sustainable growth of fitness back to previous high levels ready to taper for a race. My training camp isn’t wasted by a recovery week, the benefits will be there and I’ll see them soon. The overall trend in fitness and performance is positive and it’s hard to lose the results of months of work in seven days. I may have been disappointed to be sidelined after such a good camp, but I wasn’t afraid. I know I can come back strongly from this and with good planning reach a little further.